It's rarely a good idea to sign a player to his first big contract after his first big season. It's an even worse idea when that player was a supporting member of a high-powered team. That's what the Buffalo Sabres are learning after signing Ville Leino to a 6-year, $27 million deal after he scored 53 points as a 27-year-old sophomore in Philadelphia. Leino came to Buffalo at the perfect time to get paid; Terry Pegula took over as owner and made it rain in a city which might as well have been a desert. The Sabres suffered through years of penurious owners who refused to spend almost any money on anyone. Buffalo's best players left for greener pastures annually, forcing the team to replace them with inexpensive players from the minors. Within that context it's unsurprising fans were so excited that UFAs were finally coming to Buffalo in 2011. That excitement turned to regret quickly—like when you wake up after drunkenly spending way too much money at the bar. Sure, ordering that round of closing time Jägerbombs is a lot of fun, but the next day you're left with an empty wallet and a pounding headache. Leino is Buffalo's closing time Jägerbomb. And bomb he has. He scored just 8 goals and finished with 25 points. Clearly, $4.5 million doesn't get you what it used to. Lindy Ruff tried to turn him into a centre at points during the season, which didn't work at all, and Sabres fans can only take solace in the fact that Leino has five more seasons to turn it around. Wait, that wasn't encouraging? Have a drink. Ilya Bryzgalov signed the largest deal for any goalie this past off-season, $51 million over 9 years, which was a whopping $47 million more than the next largest contract given out to a goalie. Brygalov came on strong over the last month of the season, to the point that his save percentage was reaching respectability, but he hasn't come close to providing the Flyers with value. Bryzgalov's salary is $10 million this season, which is more than 16 times the salary of the best goalie—and best player—signed last summer. Brian Elliott signed with the St. Louis Blues for a paltry $600,000, and has been one of the best goalies in the entire league. Elliott leads the NHL with a .940 save percentage, which is the highest mark of all-time, and has a 1.56 GAA and nine shutouts. He has only played 38 games this season due to Jaroslav Halak's resurgence, but has been so good splitting duties there is no way there is a better free agent signing. If the Flyers decided to sign Elliott instead of Bryzgalov they would not only have saved themselves over $9 million this season, but they would have saved close to 50 goals. The Blues locked Elliott up for the next two seasons at a cap hit of $1.8 million per year. Splitting time with Halak must have really kept Elliott with a back-up's mentality. Have some self-esteem, my man, you just posted the highest save percentage of all-time. All-time! Get yourself some money. This year the player with the lowest plus/minus isn't winning this inglorious award. Milan Jurcina finished with a league worst minus-34, but it is his teammate, Nino Niederreiter, that registered a more disastrous season. Niederreiter finished with the second worst plus/minus in the NHL at minus-29, but what makes that an even more awful mark is that Niederreiter played in 10 fewer games than Jurcina and played almost eight and a half minutes less per game than his New York teammate. Essentially, anytime Niederreiter was on the ice the opposition was filling the Islanders' net. The only reprieve the rookie got was when maintenance staff halted play to replace the burnt out goal light. The whole season was a complete waste for Niederreiter as he tallied a lone goal and no assists. If that wasn't enough he even suffered a concussion. That is the season nightmares are made of. I would really like to hear the logic behind keeping Niederreiter with the Islanders for the majority of the season as he provided absolutely nothing and playing in the NHL was probably detrimental to his development. The island: where young players' dreams go to die. I didn't think anyone had a shot at usurping Nicklas Lidstrom and Teemu Selanne in this category, but Ray Whitney came out of nowhere and had one of the most remarkable and surprising seasons in recent memory. There was nothing to suggest that Ray Whitney was going to have the type of season he did. He's been productive the last few years, scoring close to 60 points in each of the past two seasons, but he was approaching 40 and that usually means a decline in performance. At least that's what typically happens. Instead, Whitney led the Coyotes in scoring at the ripe old age of 39, matching the second highest point total of his career. Whitney's 77 points put him in the top-15 in league scoring and allowed him to break 1000 points in his career. Did Ray Whitney just put up the quietest 1000 points in league history? Yup. This was bound to happen sooner or later. The 42-year-old Roloson has been playing on borrowed time for a number of years and Father Time finally caught up with him. The Lightning were desperate for goaltending last season until trading for Roloson mid-way through the year. He was a rock for their improbable run to the Eastern Conference Final, so they rolled the dice this year, hoping that the old man had something left in the tank. He didn't. Roloson's .886 save percentage was the lowest of all qualified goalies and his 3.66 GAA was on its way to the moon before the Lightning planted Roloson on the bench. The Lightning had playoff aspirations after coming within a game of the Stanley Cup Final in 2011, but a porous Roloson made sure that not even a 60-goal season from Steven Stamkos was enough to get them back into the post-season. What's the difference between Max Lapierre and Alex Burrows? Two gingers. This award might essentially transform into the "whoever is playing with the Sedins" award, just because playing with the twins is a guarantee to turn anyone into a sniper. Since Alex Burrows started playing with the Sedins the league average shooting percentage has been slightly under 11%. Over that same period of time Burrows has scored on slightly more than 16% of his shots. That's 5% higher than the rest of the league. That's a pretty great rate for a guy who wasn't even scoring at that clip in the ECHL. The Sedins have an unnatural ability to feed beautiful passes into the smallest windows. Their chemistry together is something that just can't be replicated by anyone, and Burrows has a little of that chemistry rub off on him just by skating somewhere in the vicinity of the two Swedes. Put your stick on the ice, go to the net, and 20 goals are a guarantee. Is Burrows a good player? Definitely. He plays a tough, two-way game and has a good nose for the net. He plays with an edge and has a nice real estate empire under his opponents' skin. But is he a true sniper? Not a chance. Put him on any other line and he will turn into his true self: a good third line checker—sort of like how a Mogwai turns into a Gremlin if you feed it after midnight. Jaromir Jagr is back in the NHL, but unfortunately his mullet had VISA troubles and was denied entry, leaving it stuck back in the KHL. Rumour has it the mullet is in negotiations to sign a deal with Metallurg Magnitogorsk to play wing with Sergei Fedorov. That's sad the mullet couldn't make it back, but Jagr thankfully left that weird landing strip goatee in Siberia as well. If Jagr returned to the NHL rocking the mullet he would have won this award easily, regardless of how flowing his locks really were. It would have been a lifetime achievement award, like when Martin Scorsese won an Oscar for The Departed. Alas, Jagr deprived us of recognizing the best/most ridiculous hockey hair of all-time. That means this year's award will go to another player with a great hockey hair career. The mullet is back in Edmonton. I don't mean in style; the mullet never went out of style Edmonton. I mean Ryan Smyth is back in Edmonton and there's just something that feels so right seeing the official hair style of Alberta represented so proudly on the Rexall Centre ice. 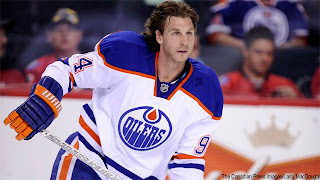 Ryan Smyth, we salute you and your dedication to the preservation of the mullet in hockey. Henrik Zetterberg wins this award hands-down, but that's a little unfair because he hasn't shaved his beard in what seems like a decade. Zetterberg's beard is so majestic I've seen lions jealous their manes don't grow as rich and full. Unless Zetterberg shaves his beard sometime soon it looks like there is a monopoly on this award. I'm retiring this award because there was no waiver pick up that can in any way compare to last year's winner, Michael Grabner. Picking up Grabner for nothing last season was such a good move that it made people temporary forget that the Islanders signed both Alexei Yashin and Rick DiPietro for a combined 25 years. Sure, people only forgot for five minutes, but that's still impressive. The Cheap Shot Artist Formerly known as Matt "head-hunting" Cooke is ineligible for this award after becoming completely rehabilitated to the point of having a semi-legitimate Lady Byng campaign. His turnaround is a great example of how anyone can change. Cooke is one of the greatest cheap-shot artists of this generation, yet the threat of being essentially expelled from the NHL made him change his ways. That's the type of tough-on-crime approach Brendan Shanahan needs to employ with regularity, not just during the first week of the season. In Cooke's absence, no one really stepped up the dirt game. No one slashed anyone in the head; no one kicked in anyone's ankle; and most importantly, no one really accumulated a number of egregious offenses. No one wanted to be the new Matt Cooke. No one wanted a permanent Shanaban. That makes this award harder to hand out. Brad Marchand is a worthy candidate, and Zac Rinaldo seems like he has a few Claude Lemieux Awards in his future, but this year's award goes to an unlikely candidate: Duncan Keith. Keith doesn't win his first Matt Cooke Award for an accumulation of dirt, rather he wins for one outrageously blatant act. Keith threw one of the greatest, most dastardly, flying elbows at Daniel Sedin's large, unsuspecting head. The finishing move delivered a concussion that forced Sedin to miss the remainder of the regular season and the start of the playoffs. The act was so blatantly malicious that it was as if Keith either had a momentary brain snap or he figured he was an actual hockey player, and actual hockey players don't get suspended for cheap shots. Unfortunately, Keith forgot that real hockey players only escape punishment when they assault a replaceable jobber. Keith injured no jobber. The only reason Keith avoided severe punishment was because the crime occurred so late in the season. A 5-game ban is nothing. If that elbow was delivered in the preseason Keith is looking at a 10-game suspension, and even that is light. Keith may have escaped the full extent of the Shanaban, but he won't escape an award for his cheap shot. Maybe this will serve as a wake-up call and the elbow will become a lone, random act of violence in an otherwise pretty clean career. Or Keith can grow a goatee and embrace his inner villain. His choice. Great post. Hard to argue with any of your pics. Though I think Mason was worse than Roloson. I would like to see you add a category for biggest whiner. I think Alex Burrows could take a second category. Thanks! Maybe I could add a best diver award too and make sure the Canucks start really cleaning up. No Shea Weber consideration for best beard? Was it disqualified for killing a man? Hank should have at least received a nod for best hockey hair. Nevermind, I was thinking best hair in hockey, not mullet.